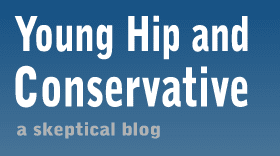 Young, Hip and Conservative: a skeptical blog: Does this make me a Rebecca Watson supporter? I absolutely hate online petitions. I think they are on par with signing your name on a used cocktail napkin and then throwing it away. It turns out the one thing that will get me to sign one is spite for an even worse online petition. Someone created a petition to ask the creators of the Skeptics' Guide to the Universe to boot Rebecca Watson from the show for being "divisive, hostile and authoritarian." I generally like Rebecca Watson. It's true. While she's a far-leftist and a third-wave feminist, I don't fault her for these things and she genuinely makes me laugh with her wit and humor. I think she's put a lot of work into organizing various skeptic groups and events and I'm glad she's on the panel of one of my favorite podcasts. It's true Watson occasionally gets a little preachy on things like abortion on the show, but host Steve Novella does a great job of keeping the program apolitical. It's not perfect, but it approaches it. Someone else created a counter-petition in support of keeping her on the show, and I gladly signed it. Online petitions are stupid, but when there are two contrasting ones I don't mind helping skew the numbers in the proper direction.